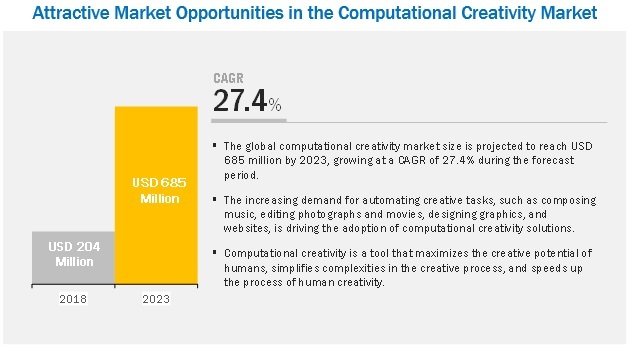 [158 Pages Report] The global computational creativity market size to grow from USD 204 million in 2018 to USD 685 million by 2023, at a Compound Annual Growth Rate (CAGR) of 27.4% during 2018–2023. The study consists of 4 major activities to estimate the current market size of the market. An exhaustive secondary research was done to collect information on the market, the peer market, and the parent market. The next step was to validate these findings, assumptions, and sizing with the industry experts across the value chain through primary research. Both the top-down and bottom-up approaches were employed to estimate the complete market size. Thereafter, the market breakup and data triangulation procedures were used to estimate the market size of the segments and subsegments of the market. In the secondary research process, various secondary sources, such as D&B Hoovers and Bloomberg BusinessWeek have been referred to for identifying and collecting information for this study. Secondary sources included annual reports; press releases and investor presentations of companies; whit papers, certified publications, and articles by recognized authors; gold standard and silver standard websites; real-time payments technology Research and Development (R&D) organizations; regulatory bodies; and databases. Various primary sources from both supply and demand sides of the computational creativity market were interviewed to obtain qualitative and quantitative information for this study. The primary sources from the supply side included industry experts, such as Chief Executive Officers (CEOs), Vice Presidents (VPs), marketing directors, technology and innovation directors, and related key executives from various vendors who provide the computational creativity software and associated service providers and system integrators operating in the targeted regions. All possible parameters that affect the market covered in this research study have been accounted for, viewed in extensive detail, verified through primary research, and analyzed to get the final quantitative and qualitative data. This research report categorizes the computational creativity market based on nature of payment, component, deployment mode, enterprise size, vertical, and region. 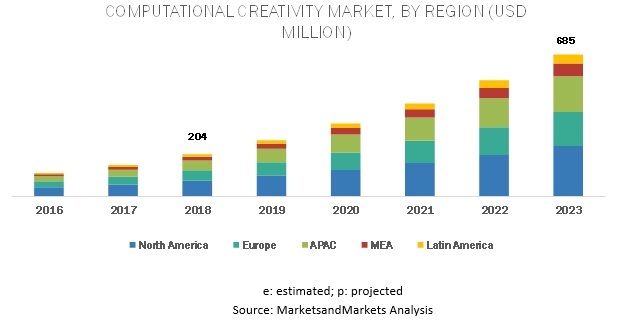 MarketsandMarkets forecasts the global computational creativity market size to grow from USD 204 million in 2018 to USD 685 million by 2023, at a Compound Annual Growth Rate (CAGR) of 27.4% during 2018–2023. Major growth drivers for the market include automation of creative tasks and adoption of computational creativity solutions which would improve the creative process. Computational creativity in product designing is playing a crucial role by acting as a creative tool to engineers and product designers. With the help of AI-powered creative solutions, it is possible to generate a wide range of design options for products in less time, which would otherwise take a lot of time for human designers. The generative product design approach is useful to various industries, such as automation, aerospace, architecture, industrial machinery, consumer goods as well as building products to develop innovative designs. An increasing demand for the improvement of creative process and efficiency of creative professionals is expected to drive the machine learning (ML) and deep learning technologies. The AI-based computational creativity uses ML algorithms to help creative professional with different types of creativity, such as music composition, culinary arts, photography, videography, fashion designing, and website designing. Most of the companies are focusing on integrating AI technology into their products and enhancing their AI, ML, and deep learning capabilities, which are integrated into its cloud services that include creative intelligence, experience intelligence, and content intelligence. The services segment is further sub-segmented into professional and managed services. Services play a vital role in the functioning of computational creativity solutions. They are an integral step in deploying technology solutions and are taken care by the solution and service providers. As the market grows, the demand for services is also expected to increase, particularly for consulting and integration, and support and maintenance services. North America is expected to hold the largest market size in the global computational creativity market, while APAC to grow at the highest CAGR during the forecast period. In APAC, the highest growth rate can be attributed to the heavy investments made by private and public sectors for enhancing their marketing technologies, resulting in an increased demand for computational creativity solutions to deliver a creative content to their customers. North America is expected to be the leading region in terms of adoption and development of the computational creativity technology. Growing investments in computational creativity technologies, presence of maximum number of computational creativity solution providers, and increasing government spending on AI technologies are expected to contribute to the growth of the market during the forecast period. Major vendors in the global computational creativity market include IBM (US), Google (US), Microsoft (US), Adobe (US), Amazon Web Services (US), Autodesk (US), Jukedeck (UK), HUMTAP (US), Amper Music (US), ScriptBook (Belgium), B12 (US), The Grid (US), Canva (Australia), Hello Games (UK), IntegraPay (Australia), B12 (US), The Grid (India), Lumen5 (Canada), Skylum (US), Logojoy (Canada), Runway (US), Avia (Luxembourg), Prisma Labs (US), Object AI (Hong Kong), Firedrop (UK), Obvious (France), Automated Creative (UK), and Cyanapse (UK). They have adopted various organic and inorganic growth strategies, such as new product launches, partnerships and collaborations, and mergers and acquisitions, to further expand their presence in the global market. IBM is a significant player that delivers solutions to the computational creativity market. The company’s solutions use Watson’s capability for various applications. IBM focuses on scaling its platforms, delivering productivity through automation, infusing AI into its offerings, and investing to expand its cloud infrastructure. The company uses organic and inorganic growth strategies to improve its market share and annual revenue growth. As a part of its organic growth strategies, in May 2017, IBM introduced PowerAI, a deep learning software designed to address the challenges faced by data scientists and developers. It simplifies the development experience with tools and data preparation while reducing the time required for AI system training from weeks to hours. Google is one of the key technology players in the computational creativity market. The company heavily relies on its organic growth strategy of developing innovative next-gen products. The company is making significant R&D investments in areas of strategic focus, such as advertising, cloud, machine learning, and search, as well as in new products and services. The company is adopting the organic growth strategy to gain a competitive edge in the market. In November 2018, Google Cloud, along with 20th Century Fox, developed an ML software that can analyze movie trailers and predict how likely people are to see those movies in theaters. The co-partners have designed a program named Merlin, which can recognize objects and patterns in a trailer to understand movie scenes. Adobe, a digital marketing and media solutions provider, is following various inorganic and organic strategies to further strengthen its position in the computational creativity area. The company offers tools and solutions to help large enterprises and SMEs to create, publish, as well as promote their digital content. Various companies are using Adobe suite products, such as Photoshop or Illustrator, to work on different projects. Nowadays, the use of AI technology is growing in the creativity field and Adobe is also focusing on integrating AI technology (Adobe Sensei) into all its products. For that, the company is taking several steps to enhance its AI, ML, and deep learning capabilities, which are integrated into its cloud services that include creative intelligence, experience intelligence, and content intelligence. In November 2018, Google Cloud, along with 20th Century Fox, developed Merlin, an ML software that can analyse movie trailers and predict how likely people are to see those movies in theatres. Merlin can recognize objects and patterns in a trailer to understand movie scenes. In November 2018, IBM partnered with Kronos Incorporated, a US-based multi-national workforce management software and services company, to help improve the engagement, performance, career development, and retention of hourly workers and simplify the complex task of managing this important segment of the global workforce. In August 2018, Adobe (US) collaborated with Nimble Collective, a provider of cloud-based animation platform. With the collaboration, Nimble Collective aims to integrate Adobe Creative Cloud into its Virtual Studio Platform. The integration would help the Virtual Studio Platform users achieve efficient work environment for all the steps of animation production. What are the current trends in the computational creativity market driving the demand for technological advancements? What are the upcoming technologies driving the market? Which are the vendors in the market and competitive analysis? What are the drivers and challenges of market?